A recent study by Transparency Market Research (TMR) forecasts that the global cellulose fibers market will grow at a CAGR of 9.8% between the years 2012 to 2018. TMR, a market intelligence firm based in the United States, in its report says that the glycolic acid market which was valued at US$12.63 billion in 2011 will report a market value worth US$24.17 billion by 2018. The report is titled ‘Cellulose Fibers Market - Global Industry Analysis, Size Share, Growth, Trends and Forecast, 2012 - 2018’. According to this research report, the global cellulose fibers market is propelled by rising demand for skin friendly, eco-friendly, and biodegradable fabrics from the textile market. Some of the extensively used man-made cellulose fibers include rayon and its various types like viscose fibers, triacetate, and acetate. The production of man-made cellulose fibers involves the application of cheaper and renewable feedstock as against their synthetic alternatives. This TMR report states that the global cellulose fibers market is segmented on the basis of application, and geography. On the basis of application, the global cellulose fibers market is segmented into fabrics, spun yarn, clothing, and other applications. The other applications category includes tapes, sealants, and adhesives. The biggest application segment with the highest contribution in the overall cellulose fibers market is that of clothing. This segment accounts for more than 50% of cellulose fibers produced all across the globe. Tencel, Iyocell, viscose, modal, and rayon amongst others are some of the various regenerated forms of cellulose fibers that are widely used in the clothing industry. Different types of fabrics and clothes make use of such forms of cellulose fibers depending upon their respective properties. It is anticipated that the clothing segment will witness robust growth in the years to come. Furthermore, the demand for cellulose fibers from the spun yarns segment is also expected to increase in the forthcoming years. Regionally, the global cellulose fibers market is classified into Europe, the Asia Pacific, North America, and Rest of the World. 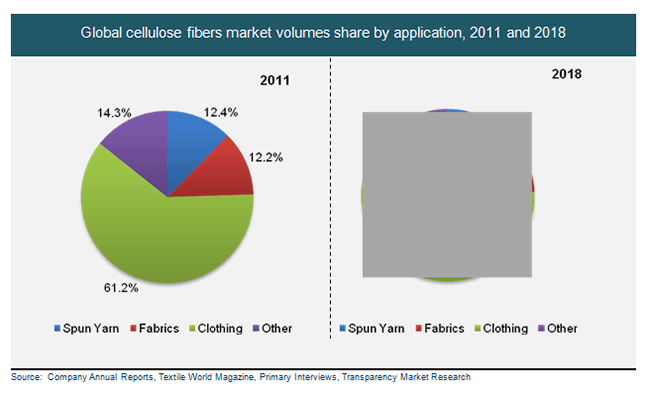 Back in 2011, the global cellulose fibers market was dominated by the Asia Pacific both in terms of volume and revenue. The Asia Pacific market will be growing at a healthy CAGR of 8.1% between the years 2012 and 2018, and will continue to lead the global cellulose fibers market. The growth of the Asia Pacific cellulose fibers market can be attributed to rising demand for cellulose fibers from the textile industries of countries like India and China. The mature cellulose fibers market in Europe and North America is expected to grow at a slower rate as against the Asia Pacific cellulose fibers market. The main challenge facing the global cellulose fibers market is higher cost of production which is a consequence of greater environment-based regulatory measures, and fluctuating prices of wood pulp. Some of the key players operating in the overall cellulose fibers market are KelheimFibres, Daicel Corporation, Thai Rayon, PT. Indo-Bharat Rayon, TangShanSanyou, Grasim Industries Limited, and Lenzing AG.